I’ve looked, but have been unable to find any populist headlines screaming “Market behaves in line with historical trends of rising and falling” or “Share values fall but as they rise again £26bn hasn’t been wiped anywhere”. I have seen various explanations of the cause, but consensus seems to be that it is America’s fault. 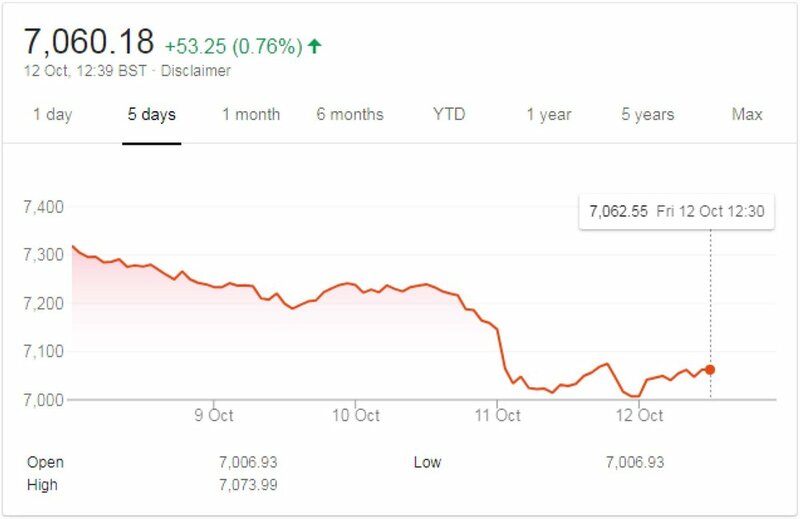 The Daily Telegraph, for example, says the FTSE 100 “took its cue from Wall Street to hit a fresh six month low”; they then explain the reasons why America has failed. We are not appreciably closer to clarity on the terms of Brexit, and whilst March 2019 gets closer by the day, it has been doing for some time, without movements as sharp as this. The government appears to be fundamentally split and the thought of John McDonnell as Chancellor terrifies many, but not more so than last Friday. Markets are too high and overvalued – but according to whom? You can find plenty of observers (including us) who think the UK is unjustly beaten, and on a PE ratio is not overvalued at all (it’s currently 13, ten months ago was 22). The fact is, markets rise and fall and there is often no reason for it; emerging markets and Europe sold-off following falls on Wall Street, despite widely different fundamentals in each market; a rare case of post hoc ergo propter hoc actually being accurate? The Fed’s tightening of monetary policy by raising interest rates: we have known about this for some time, it has not been accelerated and is proceeding as expected. US Stocks are elevated: Even if there is a case for this in the US (valuations are high relative to historical averages, but that doesn’t mean historical averages must always remain static) there is no such case in Europe and emerging markets where there were also sell-offs. President Trump’s trade war – a strong US dollar and crushing tariffs on China are hurting emerging market suppliers: again, a strong dollar and high tariffs are not new. Investment trust share prices have been hit by this, as we knew they would be; aside from their underlying Net Asset Value (NAV) changing, market sentiment affects the price so we saw a widening of discounts, investors only having to pay, for example, 95p for £1 worth of stock. We have seen a bounce back late yesterday and carried on to this morning, but many of the trusts we recommend are now around 5% cheaper than they were seven days ago and are trading at a discount. These discounts are shown in the following table, of the main investment trusts in our portfolios. This is great news for long term investors with cash to deploy now; for current investors it is a time to sit tight, wait for the stocks to rise again, and in the meantime collect your dividends, and actually take comfort from the fact that share prices are doing exactly what they have always done, and always will. 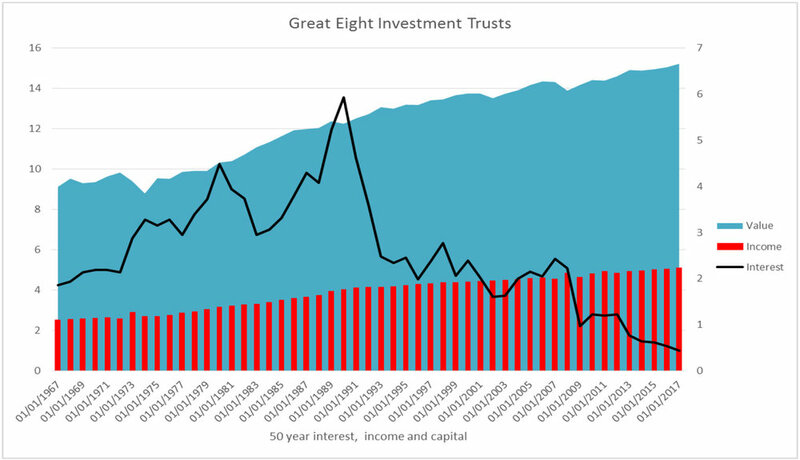 And these trusts have form: our research covers fifty years from 1967, and this chart below shows the income from ‘The Great Eight’ trusts, paid each year, versus interest on cash for each year – don’t tell the FCA but dividend income appears to have much less volatility than cash interest. The big blue area at the back is the capital growth, less the income.